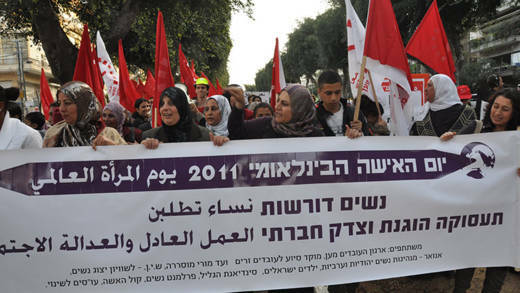 Israeli Arab and Jewish workers march together on Women’s International Day. Their banner says “Women demand fair employment and social justice". During his visit to the Holy Land, Pope Francis spoke of the “insecurity, the violation of rights, isolation and the flight of entire communities” and declared that “the time has come to put an end to this situation which has become increasingly unacceptable.” At the same time he strongly condemned violence and terrorism, and called for peaceful coexistence between Jews, Christians and Muslims, and an end to all forms of discrimination based on race or religion. stand in solidarity with all Israelis and Palestinians working for peace with justice. The majority of house demolitions are conducted for 'Administrative' reasons and are generally because the house was built without a permit. However permits are almost impossible to obtain by Palestinians living in almost 60 percent of the West Bank. There are two things that make me continue this work. Firstly it’s the feeling that my work is welcomed by people and is useful to them. The second is working with a committed team who share my responsibility. Through my work I can make change. I feel lucky to have this opportunity."